The use of the semi empirical (SE) quantum harmonic approach for calculating the proton’s mean kinetic energy, Ke(H), of systems containing hydrogen bonds (HB), is reviewed. The value of Ke(H) provides very interesting information on the proton dynamics, anharmonicity, and quantum effects. This method uses the IR/Raman and inelastic neutron scattering frequencies of the system as input data and assumes the harmonic approximation. The systems studied encompass a wide range of HBs strengths, from weak occurring in e.g. 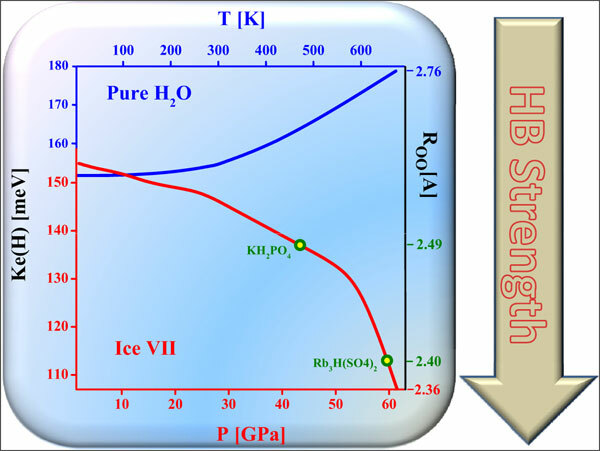 pure H2O phases and Silanol groups, via moderate, as in ferro-electric KDP-type crystals, to strong ones as in highly compressed ice VII and the superprotonic Rb3H(SO4)2 conductor. The comparison of SE results with electron (ECS) and neutron (NCS) Compton scattering measurements revealed many cases of very good agreements. In recent years, however, unusual Ke(H) values, using NCS, were reported in confined water within ≤ 20 Å size cavities such as in carbon nanotubes (CNTs) and in Beryl crystal. The Ke(H) values were found to depart strongly from those of the non-confined water. In an attempt to understand those anomalies, SE study was carried out, focusing on nano-confined samples meeting the ≤ 20Å size criteria, including carbon nanotubes, Beryl and Bikitaite. These calculations failed to reproduce the NCS anomalies. Possible sources for the discrepancies were discussed and further research to reconcile this open question was proposed. Keywords: Harmonic approximation, hydrogen bonds, kinetic energy, libration, nano-confinement, neutron scattering, proton, vibrational density of states. Keywords:Harmonic approximation, hydrogen bonds, kinetic energy, libration, nano-confinement, neutron scattering, proton, vibrational density of states. Abstract:The use of the semi empirical (SE) quantum harmonic approach for calculating the proton’s mean kinetic energy, Ke(H), of systems containing hydrogen bonds (HB), is reviewed. The value of Ke(H) provides very interesting information on the proton dynamics, anharmonicity, and quantum effects. This method uses the IR/Raman and inelastic neutron scattering frequencies of the system as input data and assumes the harmonic approximation. The systems studied encompass a wide range of HBs strengths, from weak occurring in e.g. pure H2O phases and Silanol groups, via moderate, as in ferro-electric KDP-type crystals, to strong ones as in highly compressed ice VII and the superprotonic Rb3H(SO4)2 conductor. The comparison of SE results with electron (ECS) and neutron (NCS) Compton scattering measurements revealed many cases of very good agreements. In recent years, however, unusual Ke(H) values, using NCS, were reported in confined water within ≤ 20 Å size cavities such as in carbon nanotubes (CNTs) and in Beryl crystal. The Ke(H) values were found to depart strongly from those of the non-confined water. In an attempt to understand those anomalies, SE study was carried out, focusing on nano-confined samples meeting the ≤ 20Å size criteria, including carbon nanotubes, Beryl and Bikitaite. These calculations failed to reproduce the NCS anomalies. Possible sources for the discrepancies were discussed and further research to reconcile this open question was proposed.